We have discussed the process of building the Balanced Scorecard in several of our eTraining, available at www.ScoreCardTrainings.com. In this bonus mini-lesson, we will consider some Balanced Scorecard software tools that can simplify the process of designing and implementing your scorecard. 1) You can use simple tools like MS Excel. This is an easy way to get started, but it is not a good choice if you want to grow, or if you want to save time updating your scorecard in the future. 2) You can use the Balanced Scorecard features that are included in most ERP systems. This is also not a good idea. ERP systems were designed primarily to work with finances, not with the Balanced Scorecard. Vendors notice that the Balanced Scorecard is a hot market trend, and try to add scorecard features to their systems. But the result is usually an unbalanced scorecard, limited to the financial indicators that are already in the ERP system. 3) You can use software that focuses exclusively on the Balanced Scorecard. This is the most interesting solution for the end user. But again, there are several kinds of BSC software. Some Balanced Scorecard software focuses on developing business processes, business cases, use cases, and so forth. This kind of software is really about process mapping, not the Balanced Scorecard. In most companies, process mapping is already done successfully with other tools. Does the software support Key Performance Indicator management? Does it help you to create indicators, update their values, and change their weights? Does the software support strategy maps? When you build the Balanced Scorecard, you need to start with your strategy map and then develop your Key Performance Indicators. 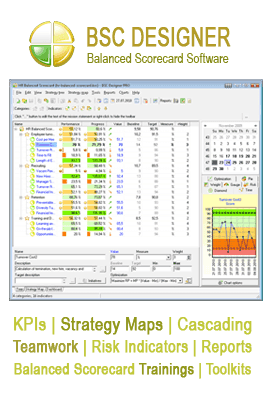 Your Balanced Scorecard software should support both strategy maps and KPIs. Finally, does the software support cascading? Unless your company is very small, it is not enough to develop one scorecard for your whole business. You need to develop a scorecard for each business unit, and link them together in a Cascading Balanced Scorecard. We recommend that you try our BSC Designer software, available at www.BSCdesigner.com. We have a freeware edition for novices, and a full professional edition that you can try without limitations for 30 days. To learn more, please visit www.ScoreCardTrainings.com.